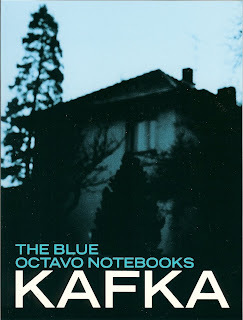 The Blue Octavo Notebooks are two years of Franz Kafka’s notes from 1917 to 1918. Franz Kafka (1883-1924) is the author of the classic fiction The Trial (1925) and The Metamorphosis (1912) among others. The title of the notebooks was devised by Max Brod, Kafka’s literary executor and close friend, to differentiate them from the regular quarto-sized notebooks Kafka used as diaries. The Octavo Notebooks contain literary ideas, fragments and aphorisms. "Everyone carries a room about inside him. This fact can even be proved by means of the sense of hearing. If someone walks fast and one pricks up one’s ears and listens, say in the night, when everything round about is quiet, one hears, for instance, the rattling of a mirror not quite firmly fastened to the wall."